It has been suggested that Geostationary balloon satellite be merged into this article. (Discuss) Proposed since July 2018. High-altitude balloons are manned or unmanned balloons, usually filled with helium or hydrogen, or in some cases methane, that are released into the stratosphere, generally attaining between 18 and 37 km (11 and 23 mi; 59,000 and 121,000 ft) above sea level. In 2002, a balloon named BU60-1 reached a record altitude of 53.0 km (32.9 mi; 173,900 ft). These balloons are launched into what is termed "near space", defined as the area of Earth's atmosphere between the Armstrong limit (18–19 km (11–12 mi) above sea level), where pressure falls to the point that a human being could not survive without a pressurised suit, and the Kármán line (100 km (62 mi) above sea level), where astrodynamics must take over from aerodynamics in order to maintain flight. Due to the low cost of GPS and communications equipment, high-altitude ballooning is a popular hobby, with organizations such as UKHAS assisting the development of payloads. In France during 1783, the first public experiment with hydrogen-filled balloons involved Jacques Charles, a French professor of physics, and the Robert brothers, renowned constructors of physics instruments. Charles provided large quantities of hydrogen, which had only been produced in small quantities previously, by mixing 540 kg (1,190 lb) of iron and 270 kg (600 lb) of sulfuric acid. The balloon, called Charlière, took 5 days to fill and was launched from Champ de Mars in Paris where 300,000 people gathered to watch the spectacle. The balloon was launched and rose through the clouds. The expansion of the gas caused the balloon to tear and it descended 45 minutes later 20 km (12 mi) away from Paris. Manned high-altitude balloons were used from the 1930s to 1960s for research and in seeking flight altitude records. Notable manned high altitude balloon flights include three records set for highest skydive, the first set by Joseph Kittinger in 1960 at 31,300m for Project Excelsior, followed by Felix Baumgartner in 2012 at 38,969m for Red Bull Stratos and most recently Alan Eustace in 2014 at 41,419m. Unmanned high-altitude balloons are used as Research balloons. Common uses include weather balloons, as well as atmospheric and climate research. They are also widely used to collect data and imagery from near space. High-altitude ballooning is used for scientific applications such as submillimetre astronomy. High-altitude balloons have been considered for use in telecommunications and space tourism. Private companies such as zero2infinity and World View Enterprises are developing both manned and unmanned high-altitude balloons for scientific research, commercial purposes, and space tourism. High-altitude platform stations have been proposed for applications such as communications relays. High-altitude balloons are often flown by students and by amateur groups to altitudes on the order of 30,000 m (98,000 ft) for both scientific and educational purposes, and have become popular among educational institutions and enthusiasts as they do not require many resources for conducting launch. Testing radio range is often a large component to these hobbies. Amateur radio is often used with packet radio to communicate with 1200 baud, using a system called Automatic Packet Reporting System back to the ground station. Smaller packages called micro or pico trackers are also built and run under smaller balloons. These smaller trackers have used Morse code, Field Hell, and RTTY to transmit their locations and other data. The first recorded amateur radio high-altitude balloon launches are recorded to have taken place in Finland by the Ilmari program on May 28, 1967, and in Germany in 1964. 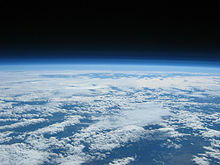 Image of the Earth's horizon taken from 26 km (16 mi) on an ARHAB flight. Amateur radio high-altitude ballooning (ARHAB) is the application of analog and digital amateur radio to weather balloons and was the name suggested by Ralph Wallio (amateur radio callsign W0RPK) for this hobby. Often referred to as "The Poorman's Space Program", ARHAB allows amateurs to design functioning models of spacecraft and launch them into a space-like environment. Bill Brown (amateur radio callsign WB8ELK) is considered to have begun the modern ARHAB movement with his first launch of a balloon carrying an amateur radio transmitter on 15 August 1987. 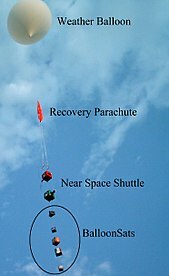 An ARHAB flight consists of a balloon, a recovery parachute, and a payload of one or more packages. The payload normally contains an amateur radio transmitter that permits tracking of the flight to its landing for recovery. Most flights use an Automatic Packet Reporting System (APRS) tracker which gets its position from a Global Positioning System (GPS) receiver and converts it to a digital radio transmission. Other flights may use an analog beacon and are tracked using radio direction finding techniques. Long duration flights frequently must use high frequency custom built transmitters and slow data protocols such as radioteletype (RTTY), Hellschreiber, Morse code and PSK31, to transmit data over great distances using little battery power. Use of amateur radio transmitters on an ARHAB flight requires an amateur radio license, but non-amateur radio transmitters are possible to use without a license. In addition to the tracking equipment, other payload components may include sensors, data loggers, cameras, amateur television (ATV) transmitters or other scientific experiments. Some ARHAB flights carry a simplified payload package called BalloonSat. Each year in the United States, the Great Plains Super Launch (GPSL) hosts a large gathering of ARHAB groups. Balloon Experiments with Amateur Radio (BEAR) is a series of Canadian-based high-altitude balloon experiments by a group of Amateur Radio operators and experimenters from Sherwood Park and Edmonton, Alberta. The experiments started in the year 2000 and continued with BEAR-9 in 2012, reaching 36.010 km (22.376 mi). The balloons are made of latex filled with either helium or hydrogen. All of the BEAR payloads carry a tracking system comprising a GPS receiver, an APRS encoder, and a radio transmitter module. Other experimental payload modules include an Amateur Radio crossband repeater, and a digital camera, all of which is contained within an insulated foam box suspended below the balloon. Image of five BalloonSats shortly after launch on an ARHAB flight. A BalloonSat is a simple package designed to carry lightweight experiments into near space. They are a popular introduction to engineering principles in some high school and college courses. BalloonSats are carried as secondary payloads on ARHAB flights. One reason BalloonSats are simple is because they do not require the inclusion of tracking equipment; as secondary payloads, they already are being carried by tracking capsules. Space Grant started the BalloonSat program in August 2000. It was created as a hands on way to introduce new science and engineering students interested in space studies to some fundamental engineering techniques, team working skills and the basics of space and Earth science. The BalloonSat program is part of a course taught by Space Grant at the University of Colorado at Boulder. Often the design of a BalloonSat is under weight and volume constraints. This encourages good engineering practices, introduces a challenge, and allows for the inclusion of many BalloonSats on an ARHAB flight. The airframe material is usually Styrofoam or Foamcore, as they are lightweight, easy to machine, and provide reasonably good insulation. Most carry sensors, data loggers and small cameras operated by timer circuits. Popular sensors include air temperature, relative humidity, tilt, and acceleration. Experiments carried inside BalloonSats have included such things as captive insects and food items. Before launch, most BalloonSats are required to undergo testing. These tests are designed to ensure the BalloonSat will function properly and return science results. The tests include a cold soak, drop test, function test, and weighing. The cold soak test simulates the intense cold temperatures the BalloonSat will experience during its mission. A launch and landing can be traumatic, therefore the drop test requires the BalloonSat to hold together and still function after an abrupt drop. The function test verifies the BalloonSat crew can prep the BalloonSat at the launch site. ^ "Research on Balloon to Float over 50km Altitude". Institute of Space and Astronautical Science, JAXA. Retrieved 2011-09-29. ^ a b "DIY balloon sent up 30km". Boing Boing. 26 October 2007. Retrieved 2008-06-08. ^ a b McDermott, Vincent (8 August 2011). "Space race for DIYers". National Post. Archived from the original on 2013-02-28. Retrieved 2011-12-28. ^ a b López-Urdiales, José Mariano (October 19, 2002). "The Role of Balloons in the Future Development of Space Tourism" (PDF). Houston, Texas. Retrieved 13 July 2015. ^ Levy, Steven (June 14, 2013). "How Google Will Use High-Flying Balloons to Deliver Internet to the Hinterlands". Wired. ^ Betancourt, Mark (July 2015). "See The World From 100,000 Feet". Air & Space. Retrieved 9 July 2015. ^ GSBC, What is a High Altitude Balloon. Retrieved August 8, 2016. ^ UKHAS, A Beginners Guide to High Altitude Ballooning. Retrieved August 8, 2016. ^ "Introduction to High Altitude Balloons". DIY Space Exploration. Archived from the original on 1 September 2013. Retrieved 13 July 2015. ^ "Amateur Radio Astronomy and weather reporting". ^ 06. Dezember 1964 - Erster Ballonstart mit Amateurfunk-Last in der DDR (in German), accessed August 8, 2016. ^ "Amateur Radio Balloon Flight Crosses Atlantic, Sets Records". American Radio Relay League. 2011-12-15. Retrieved 2011-12-15. ^ Fernandez, Lisa (2011-12-15). "Two Silicon Valley high-altitude ballooning groups vie for record". San Jose Mercury News. Retrieved 2011-12-15. ^ Boyle, Rebecca (2011-12-15). "Amateur Radio Balloon Flies From California to Algeria". Popular Science. Retrieved 2011-12-15. ^ Meadows, Ron (2011-12-12). "CNSP-11, K6RPT-11 Flight information". California Near Space Project. Retrieved 2011-12-15. ^ "Balloons Carrying Amateur Radio Payloads Still Circling the Earth". www.arrl.org. ^ "Party Balloon Carrying Ham Radio Payload Circles Southern Hemisphere a Second Time". arrl.org. ^ Tousley, Nancy (1 March 2012). "Kevin Schmidt: High Hopes". Canadian Art. ^ Sloan, Barry. "BEAR Home Page". Retrieved 19 May 2013. ^ "Exporer Scouts 632 BalloonSat slide show" (PDF). ^ Koehler, Chris. "BalloonSat: Missions to the Edge of Space". Utah State University. 16th Annual/USU Conference on Small Satellites. Retrieved 18 November 2015. Wikimedia Commons has media related to Research balloons.